Mommy just vacuumed the car, and ain't nobody eating nothing with sesame seeds in there until the clean wears off! Roast remaining beets and carrots from garden in olive oil and salt (450 degrees, over an hour, peeled and cut small). Frizz (a lot of choppd) garlic in olive oil, add (6 or 7 frozen) basil (lumps) and one can of drained chickpeas. Add roasted vegetables to chickpea pan. Cut in thin ribbons of chard (central stem cut out of each leaf). Throw in some chicken broth and cover to cook chard. Stir around. Add one box of cooked (al dente) angel hair pasta. Add leftover spinach and artichokes from Bertucci's dinner the night before. Stir around until all hot, add more broth as it gets absorbed. Add some parmesan cheese for laughs. It was so, so good! So, this week has been about getting up and going with the get up and go, and I've done varying well with that. I've put together good to-do lists and banished the scary mystery piles, so that helps. My bills are paid up to date (for today), and that makes me feel okay. I have groceries in the house. That said, I got up this morning, brought the kid to school, and knew I was not going to be getting much done today. My brain just isn't complying. I have a secret belief (don't tell anyone, or even say it out loud. When you say it out loud, it sounds crazy) that if I play dead like a possum, I can stop time and the commensurate flow of responsibilities, bills, emails and phone calls to return, the spoilage of lunch meat, the uncontrollable and occasionally violent growth of my hair, the weekly erosion of my unemployment qualification, and possibly, the inexorable trip south of my breasts. Playing possum can look like napping, or just laying on my belly reading a book. This, not surprisingly, not only doesn't stop time, it makes the very real time I'm living in go more quickly and when it's gone? I'm no farther along in my tasks and jobbies and manifesting my fuzzy vision of my personal development. So I'm trying to stay present with the time. It's hard. This morning, in the interest of not running home to sleep, I picked up a free pound of (unsalted, or course) butter at Stop & Shop (use your coupons, people! ), my free book for October from Salvation Army (punch card! ), then I hit up a church tag sale on the way home. I figured I'd only spend a few bucks, and there might be some cool books or toys for the kids. 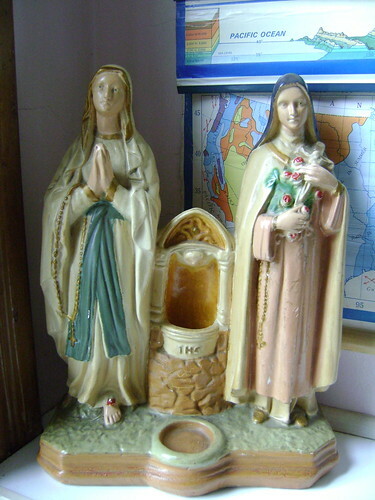 Well, there were, and I got an awesome vintage rubber duck (in hopeful belief that a trip through the dishwasher and/or washing machine would render it sanitary enough for child enjoyment), but the coolest thing I found was a(nother) big statue of Mary and St. Theresa. For those of you who have known me for a while, I no longer collect madonnas, having deaccessioned over 500 of them over the course of years. Never again. That said, it's hard to see the girls out in the world, getting disrespected. Last year I found a big (2 feet tall x 2 feet across) plaster or chalk joined twin statue of Mary and St. Theresa, which I presented to my very grateful sister Theresa for Christmas. Today what do I find at this Methodist tag sale? Same thing. For two dollars. And it was standing sort of off to the side on a table of tragedies. When I hustled up to pay for it, the woman said, "Oh yes, someone dropped that off, and they said it had been blessed, so I didn't think it would be right to throw it out." What? They were going to throw out a statue that been donated to a tag sale? I felt like some sort of papist hack, standing there explaining that it was Mary and Theresa ("See? She's always shown with flowers"), but I was grateful that I'd saved the girls. When I got home, I poked around on amazon and posted a few CDs and books I'd picked up. I've been selling a few books on amazon lately (do it! It's super easy). If I sell one unopened set of CDs I bought today, I'll make back the $10.00 I spent on the tag sale. And I'll still have scored a wooden puzzle and a few other toys for the kids. (Plus a 1968 Snoopy music box that I'm going to try to ebay, although I've never been able to sell anything there.) I looked up the statue to see if I could sell that, but I can't find anything really like it, and it's really heavy and fragile. So it's living in the kitchen for now. If my goal today was to get a job, or solve my problems or save the world? Not so much. If my job was not pass out in a depressed funk, I'm doing okay so far. My sister called me when I was setting the table, at which point I confessed to her that not only did I not know what was in the ziplock bag when I took it out of the freezer last night (lasagna? spaghetti sauce? ), but even when it was thawed in the bag, I couldn't tell. I'd already covered the vegetable (not green, but beta caroteney at least), protein (beans and crab cakes), and crap (onion rings) categories, so I figured whatever was in the bag was just gravy. Of course, it might literally be gravy. Except it was red. Tomato-based soup? I finally just dumped it in a bowl and sent it for the nuclear spin, and it turned out to be... leftover lentils and potatoes in a nice tomato sauce. Awesome -- protein and lycopene! And the best part was that the kids and everyone else horked down the whole damn thing, happily, and it was just the right amount. Abundance may not always look like an Olive Garden commercial around here, but even without the endless breadsticks, dinner's pretty tasty. Boil some pasta. Drain it. Make a white sauce. The sacred ratio for a white sauce is 2 T butter, 2 T flour, to 2 C milk, but I'm more likely to frizz a half stick of butter* in a pot until melted, throw in a few high tablespoons of flour, stir it and let that bubble for a while (a few minutes) (to kill the raw flour taste). Whisk in milk until it makes a sauce of an appropriate thickness. At this juncture, for mac and cheese, melt in as much cheese as you want, of whatever kind you wish. Season with nutmeg, salt and pepper. (If you were making a tuna casserole, you would, instead, throw in some drained canned tuna and peas. Salt and pepper to taste.) Add pasta to sauce. Remassage seasoning. Eating it out of the pot is fine and delicious, but if you want to bake it, you can put it in a heat happy dish and top with crumbs. (I mix bread crumbs with some melted butter and parmesan cheese if I have it.) Bake it (at, say, 400 degrees American) for, oh, any length of time, until the sauce bubbles up at the sides, and before the crumbs burn. * Alright, sometimes a whole stick, and a little more flour. Hi, gang. I promise I'll post at some point about myself. For the time being, you may assume that no news is, well, no news. Please keep Gabby (and goodbadgirl, too: she's dealing with some very bad health herself) in your hearts. I'm pretty sure we're here to carry each other. I briefly Facebooked this yesterday, but yesterday (after standing in line in a government building, with four children, for three hours*,**), I stopped at Mercy on the way home and ran in to weigh in, since my attempt of Friday had been foiled by the government holiday. I hadn't been in in about two months (well, I'd been in once, but my weigh was a few pounds up so I pretended it had never happened), and my loss has been slow lately (about 60 pounds this past 12 months), and I wasn't expecting much because my pants have felt the same since Christmas. I mean, I could have gained. But when I hopped on, the number was... 216.6. I don't process numbers well or quickly, so I just saw the "6" and thought, "I still need four more pounds to have lost 200 pounds." Then I thought, "Wait... is that a number in the teens?" I got on and off four times, and it stayed the same. Go figure. So I'm officially 200 pounds down. 205 (.4) to be precise. Thanks, DS! It's slow, but I'll freaking take it. I wonder how much weight I'll have to lose until I'm not a fat girl anymore? Who knows. Anyway. The next number I'll point my nose at is getting below 200 pounds. The last time I weighed 202 was in 1990, when I still lived in DC. Huh... that'll be like I lost the whole outside layer that experienced grad school. I wonder if pain and anxiety are fat soluble? Have they been dumping back into my system as I lose the weight? I thought I should celebrate, so after walking into TJMaxx and spending 3 minutes picking the pair of sandals closest to the ones that had just broken on my feet that morning (and wearing them up to the register, removing them only to pay and have the big white clip removed), The Beetle and I went to see the new Ice Age movie. So painfully boring, and one of the sweetest things ever, sitting with my laughing child in a movie seat I could fit into. With her on my lap. *People were totally glancing at me and I know they were thinking, "At least she'll be going through menopause soon." ** And they were good as gold, I tell you no lies. Yeah, yeah, I know. I need to post. I'll post for real sometime soon, I promise. Suffice to say, I'm alive and holding it together. = Non-scale victory. The ones that count. A woman who can do this? Could probably make me a pair of pants that fit well. Out of eyelash yarn.